THE MOST EXCITING AQUATIC ADVENTURE OF THE BAY! Start your day with an exciting and entertaining activity with this jet ski tour guided by an expert. It will be an unforgettable adventure. 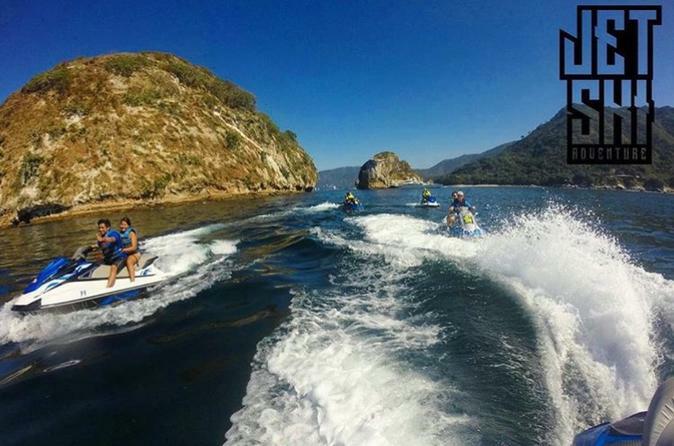 On a 2-hour tour, you will speed up a jet ski traveling from Marina Vallarta to the south part of the bay. Always accompanied by a certified guide who will assist in making this aquatic adventure the safest. Also, you will do snorkel if the conditions apply. The guide will provide you a safety speech and after take you ́ll go to the favorite places of the bay with a safe ride strategy. Searching marine creatures, going full throttle in the Pacific Ocean at Banderas Bay, and visit amazing locations. Boca de Tomates, Mismaloya, Los Arcos, Los Muertos Beach, the Malecón and Hotel Zone of Puerto Vallarta & go back to Marina Vallarta. Giving you an exceptional memory of Puerto Vallarta. Minimum age required to drive: 16 years with prior authorization of parents or guardians. Children 10 – 15 years old can participate in the activity accompanied by an adult with a paid ticket. Activity not recommended for minors, pregnant women, people with back problems or recent surgeries. Maximum groups of 5, personalized attention.